Home » Website Building » Weebly » How to Setup 301 Redirect in Weebly Site? How to Setup 301 Redirect in Weebly Site? What is the Need of 301 Redirects? External links pointing to your old URL will lead to 404 page not found error. Search engines will think that your old page is deleted remove it from search results. You will loose the search ranking position of your content and the new page will be shown in search results with very lower rank. This will be a disaster and modifying couple of high traffic pages will drag down your entire site’s search engine rank. The solution to avoid this disaster simple!!! You should setup a permanent redirect from the old page to the new page. This will help users not to see the outdated URL and titles which is no more relevant. And also your new page will retain the search position similar to the old page. Domain transfer to Weebly from other service providers. Change in your existing Weebly page URL. If you are planning to migrate your site from any other hosting service to Weebly then it is necessary to setup 301 redirect in Weebly site. This is very helpful so that you will not loose your traffic to the old site and your search engine ranking for the new site is retained as that of the old site. Here the constraint is your old and new site should have the same domain name as well as same page URL. For example oldsite.com/example.html can only be redirected to new-weebly-site.com/example.html. It is common for a webmaster to change the page URL based on the search engine performance and other factors. Whenever you change your Weebly page URL it is required to setup a 301 redirect to loose the page reputation and hence the search engine ranking. How to Setup a Weebly 301 Redirects? For both domain transfer and page URL changes Weebly offers single site settings option to setup a 301 redirect. Login to your Weebly account and select the site you want to edit. Navigate to “SEO” (Search Engine Optimization) section under “Settings” tab and scroll down to “301 Redirects” section. Enter old and new URLs and save your changes. You have an option to select the new URL from the drop down list and you can add as many as redirects for a single site. What You Can’t Do with Weebly 301 Redirects? Old and new sites are having different domain names. Old site’s page URLs are not matching with new Weebly site’s page URLs. Old site uses different page extensions like .php pages instead of .html pages. So basically it is a very simple one to one redirect that Weebly offers. 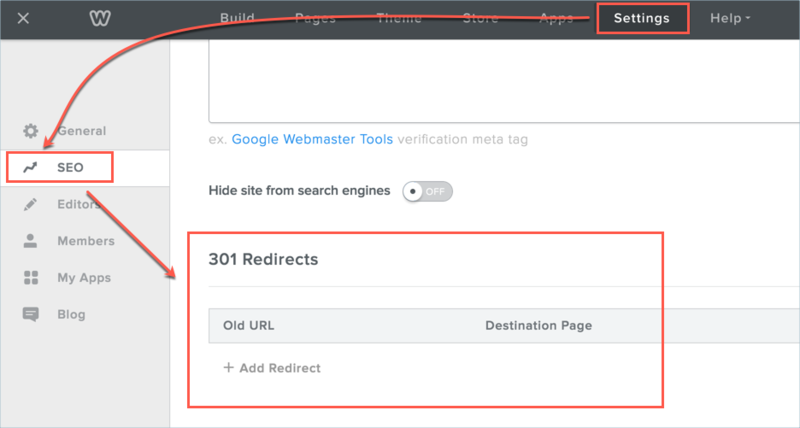 You can’t setup 301 redirect from old blog post to new blog post. You also can’t setup redirect from old single product to new single product. What you can do with Weebly is to setup redirects between standard pages, blog pages and products pages. Even you have a paid hosting, setting up 301 redirect at .htaccess level will not work as Weebly server is not controlled by these directives. So ensure to have appropriate URLs for blog posts and products which can’t be changed later.